Welcome To The Great Book Giveaway! 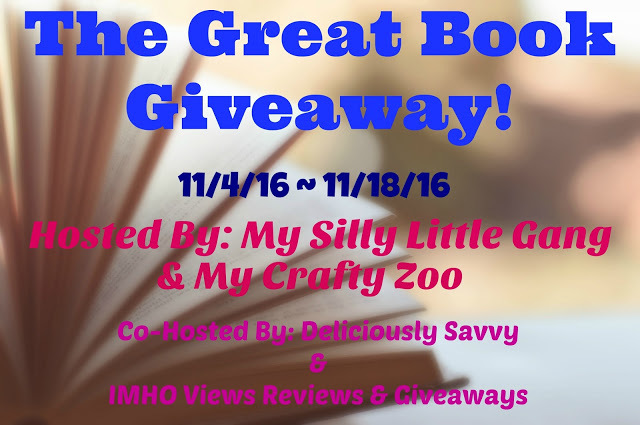 This giveaway will run through 11/18/16 at 11:59 pm Eastern Time and is open to US residents ages 18+. Winner is subject to eligibility verification and will have 48 hours to confirm before a new winner will be drawn. For any questions or concerns please email silvie.mslg@gmail.com (please consider adding this email to your “Safe List” as the winning email notification will be sent from this email.) Please refer to the full terms and conditions in the Giveaway Tools form. Thank You for stopping by! This giveaway is in no way endorsed, affiliated or associated with Facebook, Twitter or any other Social Media Networking Site. Thank You for stopping by! Use the Giveaway Tools widget below. So many fun books to win, I would love that recipe book since I am a big cook.